The YSR Congress MPs had given notices for a no confidence motion against the government for its failure to grant special status to Andhra Pradesh. New Delhi: Five MPs of the YSR Congress Party on Thursday announced that they will resign from the Lok Sabha today to protest the "failure" of the NDA government to grant special category status to Andhra Pradesh. Addressing a press conference, the MPs also said they are outraged as their notices for no confidence motion against the NDA government could not be taken up for discussion in the House due to continuous disruptions. The YSR Congress MPs had given notices for a no confidence motion against the government for its failure to grant special category status to Andhra Pradesh. The MPs said they would be submitting their resignation letters to Lok Sabha Speaker Sumitra Mahajan today, the last day of the Budget session. "Resignation letters will be submitted in proper format. There is enough time to conduct by-elections.... We would fight the polls and again continue our demand for special category status," party MP Varaprasad Rao Velagapalli said. He also accused Prime Minister Narendra Modi and Andhra Pradesh Chief Minister Chandrababu Naidu of "disrespecting democracy", saying both the leaders "failed" to keep their promises to the people of Andhra Pradesh. "YSRCP has given notices for no-confidence motion 12 times and not even once it was taken up for discussion," Mr Velagapalli said. YSRCP chief Jagan Mohan Reddy had announced in February that the party's five MPs would resign if its demand for Special Category Status to Andhra Pradesh was not fulfilled by the Centre. 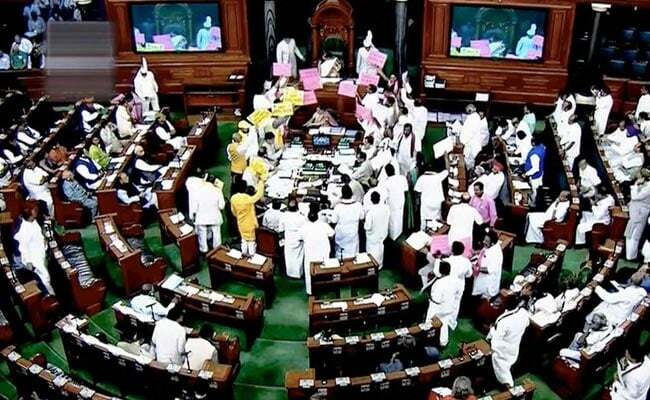 The YSRCP and the TDP, which walked out of the BJP-led NDA, had given notices for no-confidence motion in the Lok Sabha. Following this, TDP supremo and Andhra Pradesh Chief Minister Naidu had met parliamentary party leaders of various parties in an attempt to garner support for the no-confidence motion. "Naidu began fighting for special category status out of sheer pressure from the people as our leader has been ramping up pressure on him on the issue. He had no option but to quit the NDA," another YSRCP MP Mekapati Raja Mohan Reddy said. On Chandrababu Naidu's claims of nexus between the YSRCP and the BJP, he said, "Naidu is trying to club our party with the BJP. This is unfair. The TDP was in alliance with the BJP for four years and now they are blaming us."